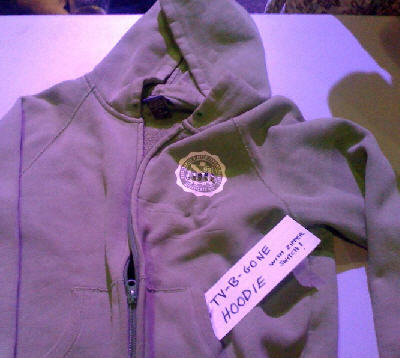 The TV-B-Gone Hoodie has a device that turns off any TV in its range. Becky Stern created it; she was at the evening party tonight at the Google I/O 2009 conference. Whenever I bring my TV-B-Gone out to restaurants, I always look real suspicious holding it up and pointing it around, so I’ve been looking for a more subtle and dinner-appropriate solution. I got zippered hoodie sweatshirt from the thrift store which had a convenient logo on the upper left front, complete with rhinestones! I thought the IR LEDs would blend in quite nicely, so I stitched it into the sweatshirt. The batteries are in the pocket. 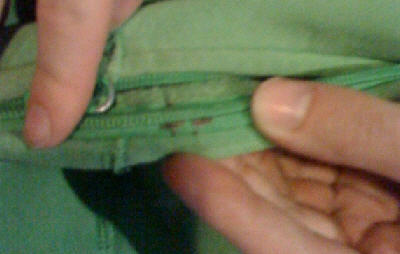 I broke out the pushbutton leads and used conductive thread to sew paths to the edge of the zipper, which has a metal pull. I made two little pads with the thread that are bridged by the zipper pull when it passes by, so all I have to do is zip the sweatshirt up or down to activate the TV turning-off action. Works great! 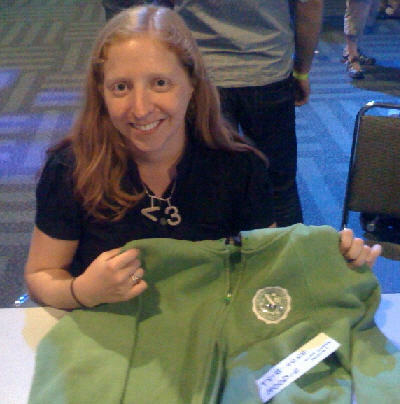 It's a pretty cool idea; Becky shows off her TV-B-Gone Hoodie in the photo below. She's lots of fun to talk with, and full of creative ideas - and the tech chops to make what she thinks of. SF author Murray Leinster thought about a sleeve communicator integrated into uniforms in 1945; he never thought you could make a call by just zipping up your shirt! Go to Becky's website to learn more - Stern Lab.